Grease stains in the kitchen - how to cope with them? No matter how carefully you cook the food and how hard you try to keep the kitchen clean, no one manages to avoid grease stains on various kitchen surfaces. The tiny fat droplets evaporate during cooking, and are deposited on the walls, ceiling, furniture, glass. You cannot prevent such formations of fat. Only a powerful kitchen hood can slow down this process. A huge amount of various agents offered by chemical industry makes cleaning easier, grease stains dissolve almost immediately, all you need is only to rinse everything and wipe with a dry cloth. Unfortunately, there is one big “BUT” – all these agents are harmful even for a healthy person, but when a family has a child or a highly allergic family member, such aggressive substances should not be used. Therefore the means come to help which have been tested by many generations of housewives, and which can easily be found almost in every home. • The simplest and most reliable way is soda. It must be used as an abrasive agent. Add some water to baking soda to get a pretty thick consistency of paste, put the mixture on the tiles, rub thoroughly with a hard sponge. For easy cleaning of tile joints, use an old unneeded toothbrush. Soda reacts with grease and as though collects it into lumps. Remove lumps with cloth. Wipe the surface with a damp cloth (preferably made of microfiber) and then with a dry one. Your tile will gloss like new. In addition to soda you can use some baking powder or a mixture of soda and citric acid. • Grease stains can be removed with an aqueous solution of vinegar. Dissolve one part of table vinegar in four parts of water. Apply the solution with a sponge to the tile, wait for fifteen minutes for a more effective action of this means. Then rinse the tile with clean water and wipe dry. • If you cannot stand the smell of vinegar, or it is too strong for you, take care of it in advance. Pour the vinegar into a container with orange peels, leave for two to three weeks and then you can use it for cleaning different surfaces. Do not forget to dissolve vinegar with water. • Mix the baking soda with vegetable oil. Take a little bit of oil to get paste and soda not to be dissolved. Apply this paste to the surface to be cleaned, wait thirty minutes. Then collect with a sponge the formed lumps of fat. When cleaning furniture do not apply force not to scratch the surface and not to remove the top layer of paint. • If the contamination is severe, use aqueous ammonia. One tablespoon of ammonia dissolve in one liter of water. For ease of application to a surface use a spray bottle. Then remove grease stains with the hard side of a sponge. • A good fat solvent is alcohol. 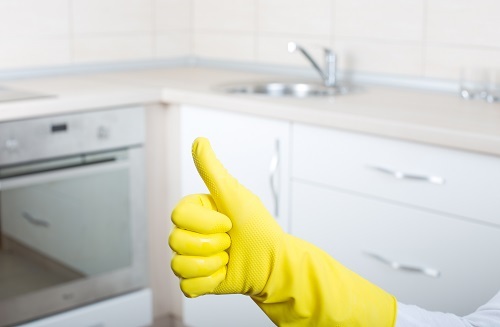 Therefore wipe the dirty places with a sponge soaked in a solution of alcohol or vodka. To enhance the action leave wetted surface for twenty or thirty minutes. Wipe the surface with a damp cloth. When cleaning wooden surfaces add a few drops of the essential oil you like most of all in the water. A good choice would be the orange or juniper oil and tea tree oil. Essential oils have a favorable effect on wood, a disinfecting effect and just a pleasant smell. • Lemon juice is also a good solvent for fats. Cut the lemon and rub with it the places of contamination. Juice must flow off surface. Wait ten minutes so that juice has an effect on the fat and dissolve it. Wipe furniture with a damp cloth and then wipe dry. • Use baking soda to clean it. Previously moisten the surface with a solution of vinegar or citric acid, it will enhance the action of soda. If the stains are longstanding, after applying a mixture of baking soda and lemon juice wait for fifteen or twenty minutes, and then rinse the stove with clean water. • You may clean the stove and oven by using ammonia. Wipe all surfaces with a well moistened cloth. Leave them for a long time so that ammonia corroded the grease formations. Wash thoroughly the surfaces. Do not forget to ventilate the kitchen from a strong acrid smell. • An easy way to remove fat in the oven is to put on its surfaces a thick layer of salt and to heat it up to two hundred degrees Fahrenheit. Thirty minutes later, turn off the oven. When the oven cools down remove the salt. Rinse the oven with water and then wipe it dry. • You can effectively clean the oven also using a mixture of salt and soda in equal proportions adding some water to it. Apply the resulting paste-like mixture on the inside of the oven, leave it on for eight to ten hours (preferably overnight), then rinse with clean water. • Baking soda may also help to clean the greasy dishes and other kitchen utensils. • You can also use dry mustard, which is a natural solvent of fats. Now you know that to deal with grease stains is possible without aggressive household chemicals, using only ecological means.